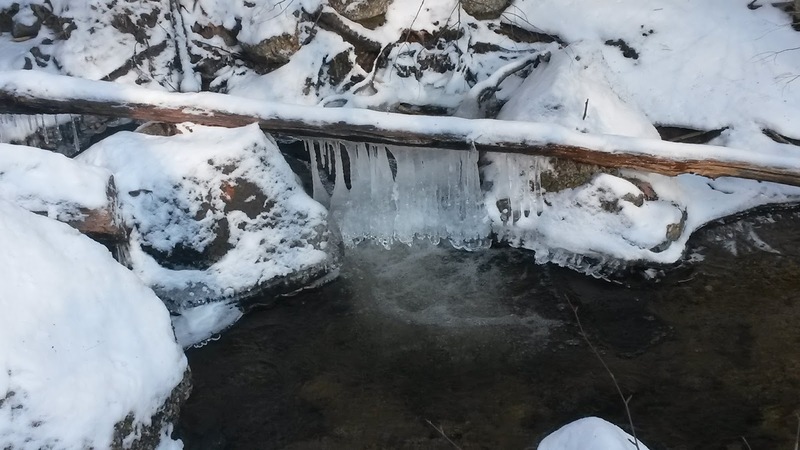 A somewhat random record of observations of what's happening around Lake Wicwas and the Lakes Region. I hope to post about once a week - your comments are welcomed. Lake Wicwas experienced another typical New England week with just about every kind of weather coming at us over the course of a few days. First, over an inch of rain fell which raised the lake level up a good eight inches. Then cold weather followed quickly, crowning the already-smooth lake surface with a sleek glassy cap. 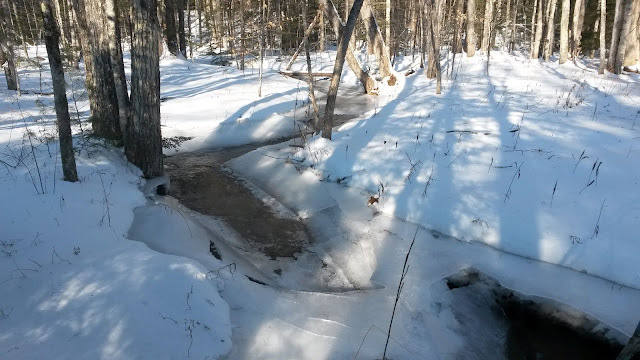 As the water flowed into the lake it raised the level and pushed the ice up, cracking the ice a few feet out from the shore because the ice at the edge of the lake is firmly attached to the shoreline. So we had more good skating on the lake before the next weather event. The next weather event: a quick snow storm. And as usually happens after a winter storm in New England, it was followed by a torrent of cold air from the northwest; this particular blast sent us winds as high as 40 miles per hour. It was wild on the lake, looking rather like the arctic, and the wind over the smooth ice blew the lake clear again in many places (click below for video). 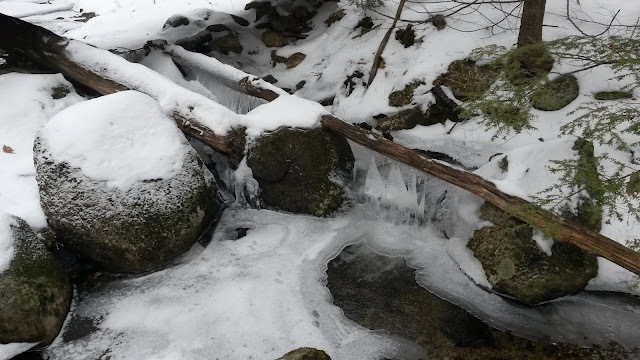 The rain had also raised the streams which froze over quickly as the mercury dropped, but when the water drained off into the lake, their ice-crust fell back into the streams, showing just how quickly small streams can rise and fall. Rushing brooks and cold temperatures always conspire to make glistening winter sights. Arriving with the snow were goldfinches, even more than the last storm - at one point I counted 28. They filled up the feeder slots, some aggressively guarding their post, others patiently waiting their turn on the taxi way. On the blustery day they were often blown off course on their approach and had to circle around to attempt a second landing. "Goldfinch 2 - You're off the glidepath - circle around and try again"
The fact that birds can fly at all in those conditions is an amazing feat, a testament to nature's ability to learn and adapt. The best algorithms put together by the brightest minds, running on the fastest computers can't manage an autonomous landing in anything near these conditions, yet these small wild animals do it a hundred times a day without even thinking about what they are doing. The birds aren't quite as adept at eating as they are at flying - or maybe they are. All the seeds they drop on the ground are perhaps intentional, as they dig through the seed looking for the choicest morsel in the feeder. The nuthatches are the most notorious at this, but the squirrels appreciate it. After the storm I counted six red squirrels on the ground at one time. Rain, snow, cold, warm, wind, clouds, sun - just another wondrous winter-week in New Hampshire's Lakes Region.